Sometimes when you're crossing the globe and have to change planes at Los Angeles International Airport (LAX), you end up with a long layover. With as few as several hours to spend between flights, you can have a bit of fun and maximize your stay in sunny southern California. There's plenty to do at an airport the size of LAX. If you have a boarding pass for a same-day flight, you can go explore any terminal, including the renovated Tom Bradley International Terminal (TBIT), which has been beautifully updated and has more amenities than any other terminal. You can entertain yourself there with fine restaurants and shopping for a few hours without ever leaving the terminal. And, if you have more time you can head out to explore the city or beaches and make it back in time to board your next flight feeling refreshed and with a few California memories to add to your travel experiences. Head to Terminal B, the newly-rebuilt Tom Bradley International Terminal. A destination in itself, the terminal resembles a beautiful upscale shopping mall with amazing multimedia public art and dining venues from some of the city's most popular restaurants. Try Chaya Sushi for upscale sushi and Japanese food, or live it up at the Petrossian Caviar and Champagne Bar. This terminal is also home to an outpost of an L.A. favorite, Umami Burger. While not as upscale as the Tom Bradley International Terminal, Terminal 3 will give you a taste of local cuisine. Grab a brew at Ashland Hill, a Santa Monica gastropub with a focus on craft beer and pub food. Sample Mezcal and Mexican food at La Familia or refresh with a milkshake, breakfast sandwich or burger at Shake-Shack, an LA favorite. If you have time to leave the airport and then go through security again before your next flight you'll be happy to know that the Los Angeles International Airport is adjacent to Dockweiler Beach, a very long strip of beach with few amenities. If you have less than four hours and are craving some beach time, this is probably your best bet, but be sure to schedule a taxi or car service to pick you up at the beach in time to get back to the airport. If you have just a little more time, it costs just a couple dollars more to get down to Manhattan Beach, the nearest beach that also has shopping and restaurants, and for just a little more, you can take a cab north to Venice Beach or Santa Monica Beach to the north. All three of these beaches have plenty of sand, waves, and beach activities to leave you feeling refreshed and ready for your next flight. If you have more than four hours and want to experience some super high-end shopping in LA, arrange a car service for the duration of your layover. Your driver can pick you up at LAX and whisk you away to funky Abbott Kinney Boulevard in Venice, Santa Monica Place in Santa Monica, Rodeo Drive, the Beverly Center, the Grove, or anywhere else you'd like to go, without having to worry about directions, parking, where to put your packages between shops or being on time to get back to the airport and check another bag full of your shopping finds. If you want to shop close to LAX, there's a two-block stretch of shops just north of the airport on Sepulveda Boulevard. This stretch is home to more standard stores such as Kohl's, Ross, TJ Maxx, Home Goods, Bed Bath & Beyond, and more. You can see much of the city during your layover by taking the Starline Hop-On, Hop-Off tour, which has four routes and two connectors, one of which stops at the Concourse Hotel next to LAX. If you have four hours or more during the day, you can hop on and off up to Marina del Rey, Venice, and Santa Monica. If you have all day, you can take an additional loop over to Hollywood. Each of the narrated tour loops takes about two hours if you remain on the bus. 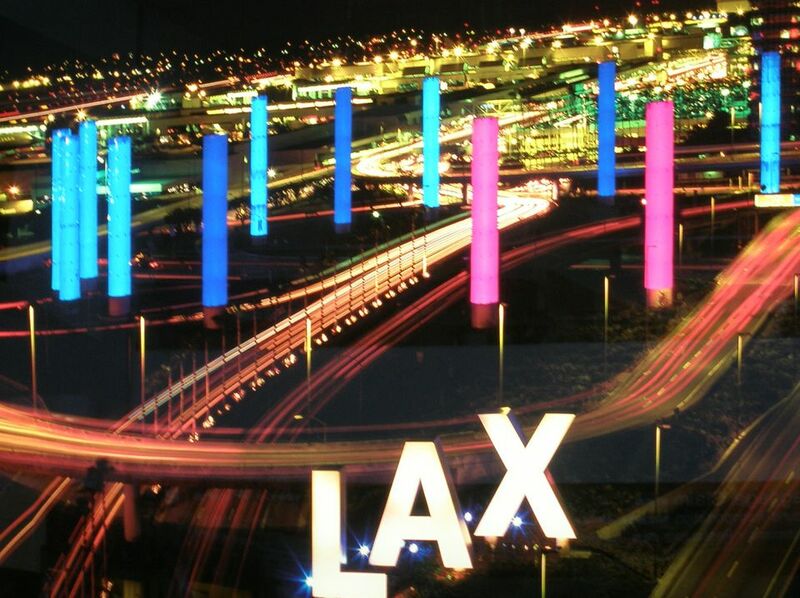 LA City Tours offers special bus tours for LAX passengers. The layover tours include a tour of LA plus celebrity homes and beaches (6 Hours with 5 Stops). They pick up at the LAX Terminal departure level. The Westchester Golf Course is an 18-hole public golf course just north of LAX airport. Tee times run from before dawn to early evening and vary by season. Prices are according to tee time and club rentals are available. You don't even have to take the time to play 9 or 18 holes as there are a 58-stall driving range and practice areas. If you've never golfed before, make an appointment with a golf pro for instruction. Some of L.A.'s most popular junk food is super close to LAX, making for an easy and quick meal. For the burger junkie, there's an In-N-Out Burger location about a 20-minute walk from Terminal 1. Famous for their thin patty burgers and iconic "Animal Style" fries, this particular In-N-Out location affords customers a great view of planes taking off and landing. The walk may not be the best due to roadways and on-ramps, so many just take a ride-share or taxi. Some even have hopped on the free shuttle for The Parking Spot, an offsite parking structure across from the In-N-Out Burger (although that's not sanctioned by the business or LAX). Other favorites in the area include the 24-hour Randy's Donut, which is famous for the giant donut out front, and Tito's Tacos, a 20-minute drive away in Culver City. Fans of aviation can visit the Flight Path Museum and Learning Center to see models, photographs, uniforms and other artifacts highlighting the role of the airline industry in the history of Southern California. It's a small museum so a visit shouldn't take more than an hour or so. While the museum is on airport property, getting there can be tricky so request a ride-share or a taxi in advance. Like the Flight Path Museum, it can be tricky to get to and will require a brief ride-share or taxi ride. Once you're there, you'll love the open, airy space, featuring a replica of a P-40 Flying Tiger plane. The Proud Bird also is a museum of sorts and houses memorabilia from the original Proud Bird restaurant and interactive aviation exhibits. If you need to relax or get the kinks out after sitting long hours in a plane with more of the same to come, stop in at XpresSpa, located in Terminal B or Terminal 5. XpresSpa offers affordable massages and other refreshing services including haircuts, manicures, and even a quick shower. Even if you don't want to spring for a full-on massage, just a quick arm or neck massage can be all you need to rejuvenate you in time for your next flight. Art lovers will find an impressive collection of art in 11 sites throughout LAX. You'll find art, including paintings and sculptures located in Terminals 1, 2, 3, 6, 7, and, of course, the TBIT. Some exhibits rotate or change so there is always something new to see. In addition to the visual arts, the airport provides live music and seasonal entertainment for travelers. If you want to say you've been to Hollywood, you can get there via the FlyAway bus service costing $10 each way. The bus brings you just one block south of Hollywood Boulevard. Or, you can take a taxi or ride-share and enjoy several hours of iconic sightseeing including the TCL Chinese Theatre and star-studded Walk of Fame.